For its fans in the architecture and design world, the Aluminaire House is vindication for the International School of architecture, a movement that reached its peak in the 1960s. During the following decades this school of building design largely fell out of favor--then ridicule and for many buildings, demolition--but in the last decade has become vaunted again for its historical impact, practicality and minimalist aesthetic. But this house is also important because it was ahead of its time for its use of prefabricated, sustainable and lightweight materials as well as its ease of construction—the norm within today's increased focus on green building and construction. The house was designed by A. Lawrence Kocher and Albert Frey, the latter of whom was trained by famed architect Le Corbusier. Frey eventually ended up designing many houses and buildings in Palm Springs and lived the rest of his life there after moving to the desert in the 1930s. Both architects wanted to show they could build a home with “off the shelf” materials. After working for almost two years on the design and working with manufacturers to make the components, the house was assembled in only 10 days. Three stories tall and with 1,100 square feet of space, the house was comprised mostly out of aluminum. Some steel was used for chairs, floor decking and windows, but the exterior panels and interior walls were unanodized aluminum. Pastel colored rayon was used as wallpaper because it was easily washable. The flooring was linoleum. Upon its completion, Frey chose the word “Aluminaire” as a play on the prevalent building material, which was just getting a start as the metal for choice in cars and jewelry, while designers favored it for its flexibility and hue. During its conception, Frey and Kocher also published a study touting the future potential of mass production the house, which they believed could be easily replicated and sold for $3,200 (about $52,000 today). Like many architects in that era, Frey and Kocher were interested in developing modern cost-effective homes that could be built affordably for the working and middle classes. Copies of the Aluminaire House for the masses never came to fruition, but after the 10-day exhibition in 1932, noted modernist architect Wallace K. Harrison bought the house for $1,000 and moved it to his property in Huntington, Long Island, New York. After six months reassembling the house, Harrison and his wife immediately enlarged it to accommodate their driver, nanny and cook so it could serve as a weekend home and summer office for the architect and his family. The house moved a few times on the massive lot, eventually becoming a guest house. Years later the property changed hands, and was largely forgotten until another owner applied for a demolition permit in 1986. The house by then had caught the attention of Joseph Rosa, a young architect who was researching the work of Frey. Rosa rallied New York architects together to save the Aluminaire House, and his efforts captured the attention of the New York Times. The house was eventually disassembled and moved to the West Islip Campus of the New York Institute of Technology, where it became used for instruction within the school’s architecture and design program. But when the university closed down that campus, the house needed to find another home. Efforts to move the house to Queens failed when local residents complained the house would not fit in with the local brownstone and row house aesthetic. Now architects and civic leaders in Palm Springs, including mayor Steve Pougnet, are busy raising funds to move the Aluminaire House from the east coast so that it can be near Albert Frey’s work in the Coachella Valley. A campaign, including a fundraising party last night during Palm Springs Modernism Week, is underway with a goal to raise about $600,000 to cover such costs. As with the case of other modernist designs, the idealism and optimism that inspired the Aluminaire House never went from conception to completion. 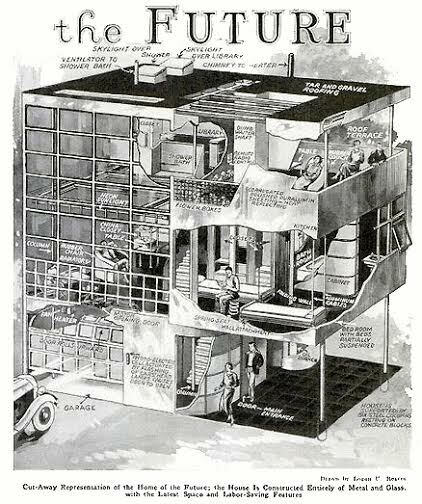 But this curious metal house that aroused so much curiosity during the Great Depression was a proud forbearer of what has become increased enthusiasm for streamlined, prefabricated and green building: the use of lightweight and sustainable materials, uniform components that also allow for custom floor plans and choosing materials that maximize air floor and minimize energy consumption. And this house, in turn, inspired, and can still generate, new ideas on how to build for comfort with limited resources and capital while providing modern and comfortable living spaces.